Forgive the frumpy appearance of this hunter-fabulous diaper bag; no matter how I positioned it, it looked bloated and irregular. It really looks normal in real life (but this is precisely why I almost never post about my knitting projects - they all take crappy pictures). It was the first sewing pattern I've worked on since the eighth grade. Considering that, I did pretty well. There were a few emergency phone calls to my mom (the sewing genius), but overall, I did alright. Oh Erin it's great. 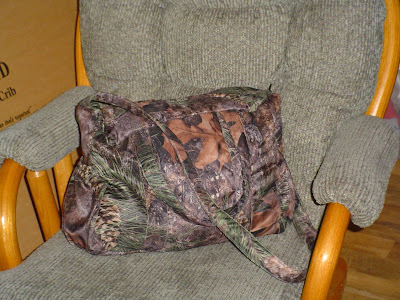 Jon says it's probably the best mossy oak diaper bag in the state of Texas and probably the whole wide West. Can you make Justin one!!!! He's not going to use the one Marie sent Meghan. It's too girly!!!! Just kidding, we will find him a guy one.